NI will be subject to EU laws/ECJ, which as Jim Nicholson (UUP MEP) writes removes NI democratic rights and probably breaches Article 3, Protocol 1 of the European Convention on Human Rights (ECHR). Trade barriers are imposed on GB-NI trade, both regulatory checks (NI buys 70% of its food from GB, which will now face full veterinary / SPS checks) plus NI will also be inside "the" EU's customs union and territory, while GB is in "a" bare-bones customs union, creating a GB-NI customs border as per Turkey's border with the EU. NI will effectively become a third country. Escaping the backstop is solely in the gift of the EU. To date EU have refused to accept or even discuss any option beyond NI staying single market & customs union. There is no escape route. This directly contradicts the December Phase 1 Joint Report (see excerpts above) and as such should be rejected by the UK. 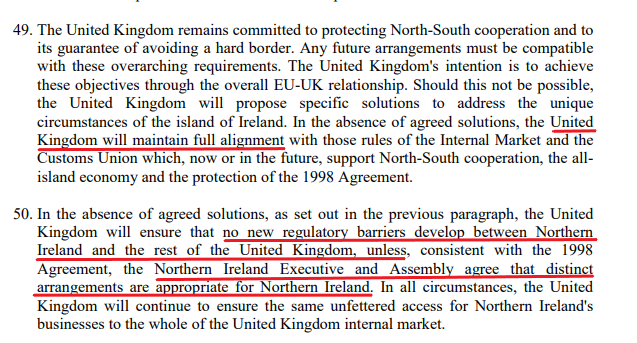 In fact, it will be better to rethink the whole NI border question based on principles in the December declaration : whole UK leaving Single Market & Customs Union, UK-wide alignment, No GB-NI barriers except via NI democratic consent. The EU's stated priority is to protect the integrity of its single market, i.e. to prevent incursion of products that do not meet its standards. At the point of UK's departure, UK will still be fully aligned on harmonised European product standards (CEN/CENELEC) and food safety standards (applied to both domestic food and food imported from third countries). In terms of sectors requiring pre-approvals (chemicals, pharmaceuticals, cars etc) product registrations with UK agencies will be transferred to EU27/EEA based agencies. While UK remains aligned on product/food standards is there really any risk to EU's single market ? Barnier highlighted the need for checks on products. But again, while UK remains aligned on enforcement of standards (i.e.equivalent market surveillance and SPS inspection regimes), is there any need for additional checks ? Cross-border co-operation (both N-S and E-W) could be established under a UK-RoI bilateral, as provided for by Good Friday Agreement (GFA) Stand 3 para 10, so that the 2 jurisdictions can co-operate and trust each others checks. Is this any different in practice from Barnier's idea of dispersed checks / checks in the marketplace ? The EU have also complained that a UK-wide backstop offers UK cherry-picked access to the Single Market. But a UK-RoI bilateral could limit such benefits to UK-Ireland trade. Checks would still apply on UK-EU26 trade and EU could monitor GB-Ireland trade flows at GB ports to ensure Ireland is not being used as a backdoor to the EU26 market. This would amount to a swiss-style equivalence agreement for trade in goods between UK & RoI only, while UK remains aligned on product standards and enforcement regimes. UK divergence in any case is likely to be limited and gradual, so "managed divergence" would be a basis for continuing the UK/RoI arrangement. In many cases, clear product labelling / marking will identify divergent goods that can only be legally marketed in one jurisdiction. It is worth noting that the Swiss agricultural agreement allows swiss to import hormone beef (banned in the EU), subject to stringent labelling and controls on circulation, while still removing all EU-Swiss trade barriers in agriculture. In other cases, goods could be limited to GB and banned in NI, subject to NI democratic consent. A joint mapping exercise identified 142 "actions" under the 12 areas of N-S co-operation established by the GFA. The extent to which this relies on common EU rules is not clear as the report has never been published. "Managed Divergence" could also cover these common EU rules. In practice, I suspect divergence would largely have no impact on N-S co-operation or require only minimal change in form of co-operation - which of course can already arise today when EU introduces or modifies regulations. - Lars Karlsson (President of KGH Border Services; Former Director of World Customs Organisation; Deputy Director General of Swedish Customs and author of Smart Border 2.0), who proposes a solution based on best global practices, trade facilitation available via AEO/trusted trader schemes, and "technology-in-trucks". - Hans Maessen, (former chairman of the Dutch association of customs brokers) who proposes a solution based on existing transit procedures and trade facilitation available in the Union Customs Code. advance lodgement of declarations used today & documentation checking via a digital platform (in line with EU's Customs 2020 plan for all-electronic customs paperwork) being explored. NI imports would not be diverted to a customs control point and Irish Revenue do not see the need for trade facilitation bays (as used on Norway-Sweden border). In truth there are numerous ways to manage customs/tariffs without border checkpoints. Ultimately, it should be seen as simply adding another component to the existing "invisible" fiscal border for excise, VAT etc. It is worth noting that excise revenues are typically much larger than tariff revenues. Customs controls and checks are primarily to facilitate and regulate legitimate trade. We should not think of customs borders as hermetically sealed with every item crossing the border being checked. Illegitimate trade is tackled by intelligence led interventions, often directly in the marketplace rather than at the border. In Ireland today, cross-border co-operation between police and customs authorities tackle criminal gangs involved in activities such as excise smuggling, fake goods etc. Technology can have a part to play in policing a customs border, but it is perfectly possible to have a "soft" customs border without adding new technology. Interestingly, ANPR cameras were installed in NI in 2010 to assist in policing smuggling. So these cameras are not monitoring every single border crossing, but are being used to track suspicious lorry movements within NI, and will continue to be so used post-Brexit. I am confident that a pragmatic "soft" border solution is possible, as described above. Contrary to some popular comment, WTO law does not require that UK erects a hard border, provided tariffs are applied consistently. But the EU's rigid "one-size-fits-all" border laws would mean RoI having to erect a hard border, if NI leaves the Single Market & Customs Union (which contradicts para 45 of the December Joint Report). The problem is lack of political will and UK signing the Withdrawal Agreement is only going to permanently embed that. The UK cannot unilaterally deliver a "soft" border, and if rigid application of EU laws requires that EU/RoI erect a hard border, then that is a matter for them. In practice, it is more likely that "No Deal" will be the catalyst for EU & RoI to think more flexibly and practically about the NI border. Leo Varadkar has suggested an arrangement would be negotiated within 2-3 weeks. The logic appears inescapable. The Withdrawal Agreement & NI backstop is a trap for the UK demanding permanent UK partition and vassalage. UK must reject these terms so that there can then be sensible and pragmatic discussions on a "soft" border solution.